Palo Alto, CA--Facebook CEO Mark Zuckerberg today announced the company's latest creation, a foray into the world of location-based services called Facebook Places. "This is going to be a really fun and interesting summer," said Zuckerberg at the start of the evening. "We've got a lot of new products coming out." The first of these new products--Places--is a smartphone-based service that takes on much of the functionality provided by existing services such as Foursquare and Yelp. Help people share where they are in a social way. See which friends are nearby. Discover nearby places and new places through friends' profiles. Michael Sharon, Facebook product manager for Places, demonstrated the service's capabilities, most of which appear functionally identical to the features already popularized by Foursquare. Through an updated version of the iPhone app or by browsing to touch.facebook.com on a mobile browser, users will find a main menu that shows nearby friends and offers a list of nearby places to check into.He also wrote about the Places feature in the Facebook blog. 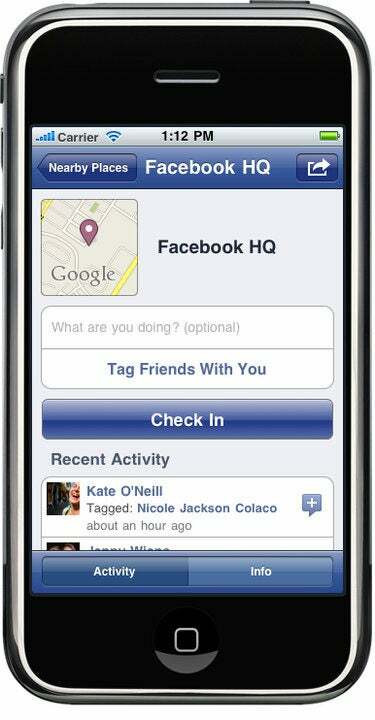 Example of the Facebook Places iPhone app as posted by Michael Sharon on the Facebook blog. Choose a place from the list and tap the "check in" button to check in, or tap the plus symbol to add a new place, and users will see a security notice explaining that they're about to share their location. The service also includes the ability to tag friends who are in the same location and check them in at the same time because, as Sharon explained, not everyone has a smartphone that supports Places yet. In light of recent concerns over Facebook user privacy, the company made a point of highlighting Places' security features. By default, check-ins are visible to friends only, though this setting is customizable to allow broader sharing or to restrict it down to just a few specific people. Users will only be able to tag people who are on their friends lists, and then only when they first check into a place. This ostensibly limits the chances of mischief with the service, particularly because the only way to check a friend into a potentially embarrassing location will be to check oneself in as well. Users will have the ability to remove themselves from any tag, just as with the existing photo sharing service. Additionally, users can choose to opt out of letting others tag them in Places. Places will also include a reporting feature that will allow users to report location listings that are erroneous, offensive, or out of date. As of Thursday, Facebook will launch a read API that lets people read check-ins and find out more about a place. A write API and a search API are currently in beta in beta testing and will be rolled out to developers soon. When Sharon finished his overview of the service, he invited representatives from several popular location-based services to the stage to describe their companies' new features that integrate with Facebook Places. Scott Raymond, CEO of Gowalla; Holger Luedorf, Foursquare VP of mobile & partnerships; Eric Singley, director of mobile products at Yelp; and Keith Lee, CEO of Booyah stepped up to the podium to talk about how they perceive the new service. Unsurprisingly, all four sounded bullish on Places, though at times the tone seemed a bit desperate. 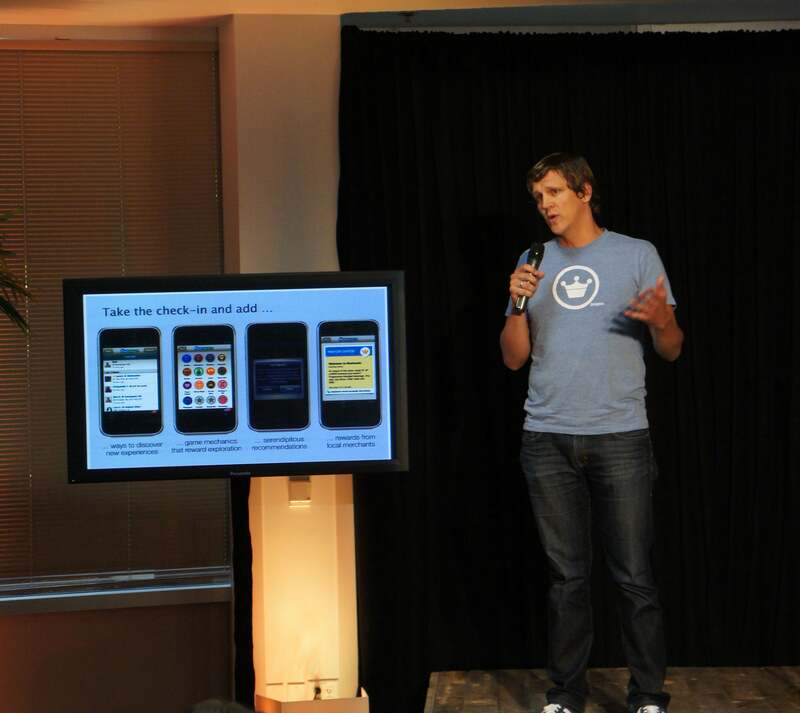 Foursquare's Holger Luedorf speaks at Facebook's Places announcement event. Holger Luedorf of Foursquare used his time at the podium to answer the question on everybody's mind: "This basically validates that we're onto something and that we're adding value," said Lueforf, focusing on the positive. "We're looking forward to working with the Facebook team." Of course, it remains to be seen whether users will still gravitate to third-party services and apps like those provided by Foursquare and Yelp once they can do most of the same things without leaving their primary social networking app. In summing up the announcement, Facebook VP of Product Chris Cox told a story of the future. He envisioned a time when a user will be sitting at a restaurant and their mobile device will begin to glow. The device will tell them which of their friends have eaten at this restaurant before, and what they ordered. It will share pictures of their friends visiting this place, and the good times they had there. He envisioned a moment when a person visits San Francisco's Ocean Beach, and their mobile device begins to glow (apparently mobile devices of the future will do a lot of glowing), and it will tell them that this was the spot where their parents shared their first kiss. It will show them pictures of that kiss, and it will share the things their friends had to say about those pictures. It's a heartwarming vision, however distant. Meanwhile, back in reality, Foursquare's Holger Luedorf looked very nervous indeed. Robert Strohmeyer is executive editor at PCWorld. Follow him on Twitter at @rstrohmeyer.